As a young man of 19, Benjamin V. Fulton arrived in Stevens Point in 1846. He was among the first men to locate here. The Fulton name has been carried on continuously here by succeeding generations. He worked as an early day Wisconsin River pilot on lumber rafts and for some years before his death in November 1900, he was a saw filer during the summer months and worked in the woods during the winter. Mr. Fulton was born in Salem, Ill., on June 17, 1827. He was married on July 21, 1857, to Miss Margaret Griffith at Randolph, who was born in Wales on June 28, 1837, and died in Stevens Point on April 30, 1907. They were the parents of six children, Thomas, Katherine, Dave, Ben, Charles and Ino. Katherine who later became Mrs. Charles West and now lives in Sacramento, Calif., and Ben and Ino Fulton, who never married, had no children. Mrs. West and the widow of Dave, the former Effie Snyder, now of Sacramento, are the only living members of that generation. The descendants are Charles A. Fulton, Mrs. Lester (Hazel) Elliott and Mrs. Harry (Ruth) Sievwright, Stevens Point; Mrs. William (Inez) Hensel, Milton Junction; Mrs. Theodore (Naomi) Uerling, Marenisco, Mich.; Mrs. George (Berta) Dell, Deerfield Beach, Fla.; and Mrs. Waldo (Florence) Marsh, Somerset; the children of Thomas Fulton and May Murray, daughter of Mrs. And Mrs. T. J. Murray, early day residents. Mervin Fulton, Stevens Point, Mrs. Margaret Meyers, Sacramento, and Mrs. Laura Schroeder, Berlin, the children of Dave Fulton and Effie Snyder. 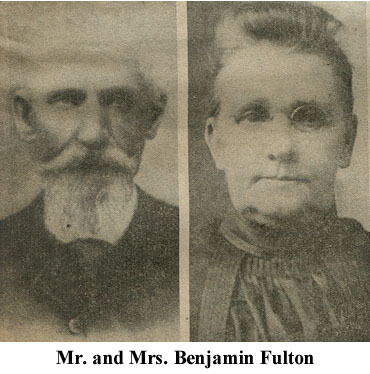 Roland Fulton and Delbert Fulton, Stevens Point, the children of Charles Fulton and Minnie Erdman. Among the families who appeared in the early day records of Stevens Point were the Martins. According to family records, two brothers, Jesse and Hiram Martin walked to Stevens Point from Portage in 1846. Later that same year the brothers built a store on the northeast corner of Clark and S. 2nd streets. In 1847 they purchased two homesteads on the Big Eau Claire River in the Wausau area and built a saw mill and dam. They continued to operate the store here along with the mill operations, running fleets to St. Louis, Mo. In 1849 they sold the Wausau property and Hiram went to Montana, where he became ill shortly after arrival. His brother Jesse went after him, making the six-month trip via team and wagon. Upon their return, Jesse sold his interest in the store to his brother and purchased property in the Martin’s Island area. Hiram later sold the Clark street store and built a jewelry store on the northeast corner of Wyatt avenue and Dixon street. Stiles A. Martin, 1517 Main St., and his brother Glenn Martin, now of Bemidji, Minn., are the only immediate descendants of the two brothers. They are the sons of Jesse and his wife, the former Mercy Content Vaughan, the parents of 12 children. Other descendants of the Jesse Martins include the children of Stiles Martin, who are Mrs. Dorothy Martin Field, Waupaca; Mrs. Virginia Martin Levenson, Boston, Mass. ; and Mrs. Helen Martin Radley, Florida; and Stiles Martin’s grandchildren Mrs. Robert Thompson, Stevens Point; George Murray, who is in military service in Germany; and Mrs. Joseph Pavlik, Tucson, Ariz. The living descendants of Hiram Martin, who was the father of five children, include seven grandchildren in California, and great grandchildren, Fred Martin and Miss Claire Martin, Stevens Point; Jack Martin, Buffalo, N.Y.; and Richard Martin, Chicago, the children of Mrs. Alice Martin, 309 Wyatt Ave., and the late Guy Martin, grandson of Hiram; and Mrs. Hubert (Gretchen Martin) Schlig, Stevens Point, daughter of the late Elliot Martin, another grandson of Hiram. AMONG THE FIRST to engage in business in Stevens Point was Jesse Martin, seated in center, who came here in 1846 and with his brother built a store at Clark and S. 2nd streets. 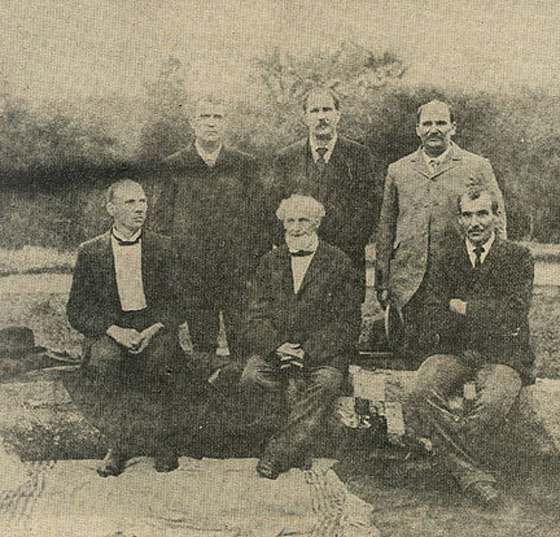 He is pictured here many years ago with five of his sons. Seated at left is Glenn Martin, now of Bemidji, Minn., and at right Stiles A. Martin, 1517 Main Street. Standing from left are, Delbert Martin, Brayton Martin and Theron Martin, the oldest son. 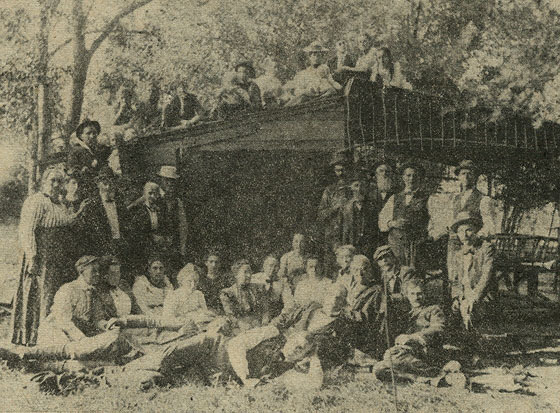 THE MARTIN FAMILY reunion held on Martin's Island in 1900 is pictured above. Standing at extreme left, with dotted skirt and white blouse, is Mrs. Jesse Martin, the former Mercy Content Vaughan. Next to her is her husband, who came to Stevens Point in 1846. Another of the earliest of the pioneers was Charles Maddy, who came here in the early 1840s and located on the West Side, where he operated a boarding house. In 1853 he married Sarah Metcalf who came to Stevens Point in 1852. They were the parents of 10 children. Local descendants include a granddaughter, Mrs. George Leahy, daughter of the former Lois Maddy, and a great grandson, John Finnessy, 305 Wilson Ave. The widow of Gaylord Maddy, son of the late Dan Maddy, lives at 729 Elk Street. Other descendants include grandchildren, Stanley Finnessy, Stockton, and Cle Finnessy, Plover, besides great grandchildren. The William Wyatt family came to Stevens Point from Plover in 1857. Their daughter, Jane Wyatt, married Melvin Olin. The Olins were the parents of William, Fred, Clara, Georgia and Millicent. All of the children are dead except Clara, who if the wife of James B. Mainland. The Mainlands live at their home at 1126 Clark Street. The Krembs name, identified with Stevens Point leading business firms through the years, was established here by three brothers, Charles, Alexander and Max Krembs. Miss Georgiana Krembs, 314 Water St., daughter of Max Krembs and the former Anna Stenger, a member of an early day family, is the sole immediate survivor of the three brothers. A young fourth brother, Alfred Krembs lived here for a time and was engaged as a painter. The Krembs brothers were the sons of Dr. And Mrs. Anton Krembs who located in Fond du Lac and later moved to Wausau. Of the three older brothers, all of whom were born in Germany, Charles came to Stevens Point first. He arrived in 1854 from his native Wurtenberg. He was followed by Alexander in 1856 and by Max soon after. Charles started in business in a small tinshop and handled a small stock of stoves. The C. Krembs and Brother hardware firm was established in 1863 by Charles and Alexander, with Max working as a tinsmith for his brothers. In October 1874 [sic], the head of the firm died and the junior member, Alexander, continued the business until his own death in January 1911. The Krembs Hardware Co. was incorporated in 1911 with Fritz A. and Anton C. Krembs, sons of Alexander, as president and treasurer, respectively. Max Krembs died in 1931. Charles Krembs’ wife was the former Catherine Streckel. Mrs. Alexander Krembs was the former Elizabeth Biegler. 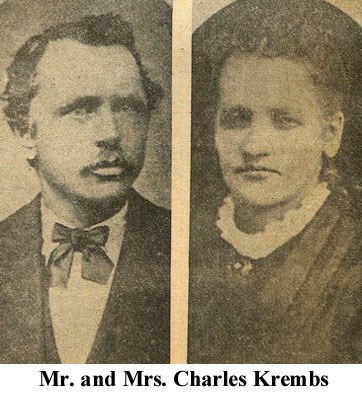 The grandchildren of the Charles Krembses are Mrs. J. M. Marshall and Mrs. Clara Faucett, Stevens Point, and the late Mrs. Charles Boyington and Ed Krembs, children of William Krembs; Carl N. Jacobs, Mrs. Leo Mingenbach, Mrs. Frederick Vetter and Mrs. Frederick C. Joerns, Stevens Point, the children of Mrs. P. J. (Josephine Krembs) Jacobs; George L. Glennon, Mrs. Guy W. Rogers and Mrs. James A. Cashin, Stevens Point, Carl J. Glennon, Portland, Ore., and the late Margaret J. and Edward C. Glennon, the children of Mrs. E. D. (Anna Krembs) Glennon; the Rev. D. L. Krembs and the late Irene and Charles Krembs, children of Louis Krembs; Mrs. Otto Lexa, Mrs. G. Trester and Mrs. E. Brezezinski, Milwaukee, the children of Mrs. E. T. (Louise Krembs) Downey; the late Lee Krembs, the son of Herman Krembs. 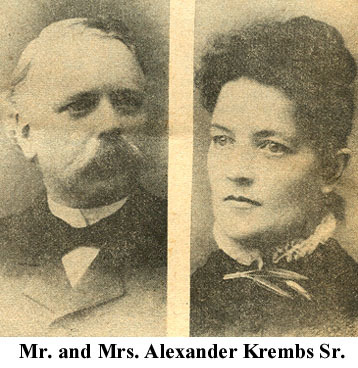 The grandchildren of the Alexander Krembses are Mrs. Irma Hope, David Krembs and Robert Krembs, Stevens Point, Mrs. John Chase, Albuquerque, N. M., and the late Dr. Ferdinand Krembs and Gretchen Krembs, children of Fritz Krembs; Mrs. Emil Pagel and Mrs. Donald Copps, Stevens Point, children of Anton Krembs; Dr. Alexander Krembs and Catherine Krembs, Milwaukee, and Gerald Krembs, Boyonne, N. J., children of Alexander Krembs; Dr. Eugene Krembs, Merrill, John Krembs, Sparta, the Rev. Phillip Krembs, Webster, Mrs. James (Lenora) Banks, Marshfield, and the late Emil and Richard Krembs, children of Emil Krembs; Mrs. Keith (Shirley) St. Onge, Albuquerque, daughter of Dr. Franz Krembs. Another son, the late Dr. Moritz Krembs, had no children. The Max Krembs grandchildren are Mrs. Barney (Janette) Zerbe, Arlington, Va., daughter of Karl Krembs, and Mrs. Hubert (Gretchen) Schlig, Stevens Point, the daughter of Mrs. Elliot (Nettie Krembs) Martin. Miss Georgiana Krembs’ maternal grandparents, the George Stengers, came here more than 100 years ago. Mr. Stenger, a Civil War veteran, was an early day business man here. He was associated with the dry goods business for a time and then operated a meat market. 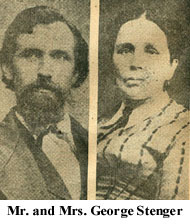 The Stengers were the parents of Mrs. Max Krembs. The Stenger home was on the southwest corner of Wisconsin and Water streets. Another name which has been carried on Stevens Point’s records through the years is that of the Glennons. The name was given root in 1857 when James Glennon located here with his bride, the former Julia Fleming. They came here from Ireland. Mr. Glennon, born in Ireland in 1828, was a riverman and pioneer logger. The Glennons were the parents of four sons and two daughters. The sole survivor of these is Mrs. James (Anna Glenn) Duggan, Stevens Point. The grandchildren of the couple are George L. Glennon, Mrs. Guy W. Rogers and Mrs. J. A. Cashin, Stevens Point, Carl J. Glennon, Portland, Ore., and the late Margaret and Edward C. Glennon, children of Edward D. Glennon; Miss Bertha Glennon, Stevens Point, and G. Nugent Glennon, Milwaukee, children of John W. Glennon; Mrs. George Burden and Mrs. Ben Nigbor, Stevens Point, Mrs. Edward Scott, Iron River, Mich., Mrs. Henry Lefebvre, Green Bay, and the late Edward Gething, children of Mrs. William A. (Catherine Glennon) Gething; Kenneth Glennon, Stevens Point, and Mrs. Ralph Schewe, Merrill, the children of Frank M. Glennon; J. Donald Duggan and Edward Duggan, Stevens Point, the children of Mrs. James Duggan; the late James P. Glennon and the late Mrs. John Crummey, both Stevens Point residents at the time of their deaths, the children of James L. Glennon. 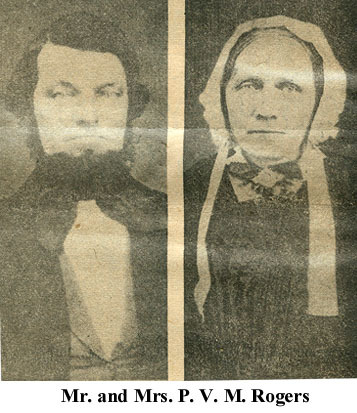 Mr. and Mrs. John Wilson Gardiner came to Stevens Point from Canada in 1850. Their only descendant now living in Stevens Point is Mrs. Hallie Clark Norton, a granddaughter, whose parents were the former Ann Elizabeth Gardiner and Owen Clark, mill owner and former mayor of Stevens Point. Their other children were John, Ellen, Jane, Emeline, Almond, Henrietta and James. Other grandchildren are Mrs. Olive Gardiner Hickok, Kenosha, the daughter of Almond, and Mrs. Myra Gardiner Kennedy, Seattle, Wash., and Mrs. Bessie Gardiner Sprung, Los Angeles, Calif., the children of John. The senior Mr. Gardiner, who built a home in the 700 block on Main street, came here to buy timber land and engage in the logging business, which took his life. He was killed in a logging operation in 1855. Harry Cadman Welty, 231 Ellis St., is the son of an early day Stevens Point couple. His father, Henry Welty, came to Stevens Point from Gettysburg, Pa., as a boy of 16 years, in 1854. He learned the carpenter trade from Martin Perkins. In 1861 he enlisted in the 5th Wisconsin Regiment and while serving in the east he was hospitalized and sent back to his home town in Gettysburg. When discharged from the hospital he re-enlisted in a Pennsylvania Regiment and served through the Civil War. He returned to Stevens Point and was married on Jan. 1, 1866, to Mary Cadman. 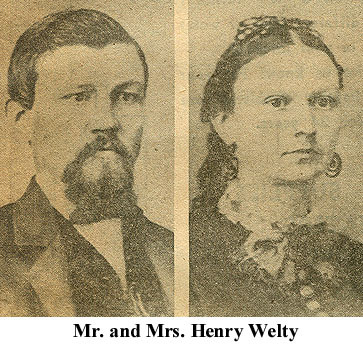 Mrs. Welty came to the U.S. from Derby, England, in 1853, lived in and around Boston for five years and in 1858 came to Stevens Point. Benjamin Burr’s first trip to Stevens Point was in 1856. He came here from Rochester, N.Y., and was impressed with the community, so returned in 1857 to establish a business with his brother-in-law, Nathan Emmons. 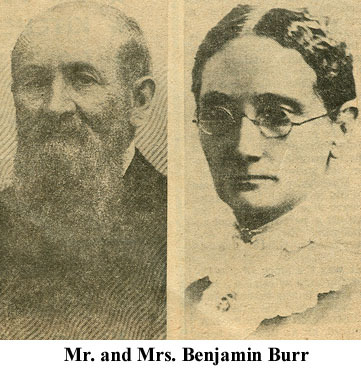 They operated a dry goods and grocery store at the present site of the Shippy Shoe store, 319 Main St. His descendants include Benjamin Burr, now of Spokane, Wash., and Edith, the wife of Win Rothman, 550 Briggs St., who are the children of Emmons Burr and Jennie Ferriss. The Rothmans’ sons are Richard of Stevens Point and Neal of Wausau. Mrs. Emmons Burr, as assistant principal, presented the diplomas to the first graduating class of the Stevens Pont High School in 1881. The class of nine received their diplomas at exercises held in McCulloch’s Hall. Fifty years later she marked the anniversary by being invited to make the presentation of diplomas to the class of 1931. The Rogers name was established here by Mr. and Mrs. Publius Vergilius Maro Rogers in 1856. They were the parents of three sons, Dave, whose wife, Hattie Sherwood, died a year after their marriage; George L., who married Armina Melinda Whitney, and Maro, the husband of Mary Peterson. The only living descendants are those of George L. Rogers, who for many years was prominent in the city’s industrial, commercial and civic affairs, having served as mayor, city controller and alderman. His children were Forest Wayne Rogers, whose widow, the former Nettie E. Moran, lives at 123 Plover St.; Chester Garfield Rogers, whose wife was the former Leota Prater; Everett Fenton, the husband of Katherine Beck; Guy Whitney Rogers, whose widow, the former Kathryn J Glennon, lives at 321 Plover St., and Alice Charlotte Rogers, wife of Lawrence G. Chapman, 602 College Ave. There are numerous grandchildren and great grandchildren. 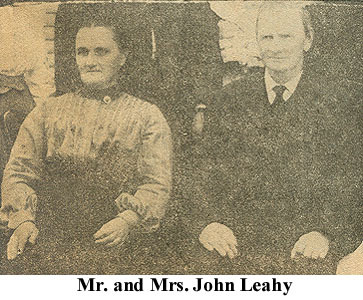 The Leahy name was brought here in 1855 by Mr. and Mrs. John Leahy, who came to Canada from Ireland in 1830, then located in Chicopee Falls, Mass., in 1836 and in Berlin, Wis., in 1850. They had 10 children, four of whom lived. The four were Dennis, John, Michael and Mrs. Ira (Mary Leahy) Lee. Michael Leahy was the father of Mrs. Martin Spellman, who died on June 13, and Mrs. William Dagneau, both of Stevens Point. John Leahy, sheriff of Portage County for four years, was the father of George Leahy, Miss Nell Leahy and Mrs. Adelaide Beardmore, all of Stevens Point, and the late Frank, Charles and Alice Leahy, Stevens Point, and Mrs. John Murray, Superior. Two sons of Frank Leahy, Allan and Weldon, live in Stevens Point. Mrs. Dan Leahy, 1207 Clark St., is the widow of a son of Dennis Leahy. Mrs. Lee (Mary Leahy) was the mother of the late Ed Lee of Marshfield, a one-time Stevens Point resident, who had business interests here at the time of his death. The Redfield name has been carried on the rolls of Stevens Point for more than a century. It was established here by Arthur Benjamin Redfield in 1853. Redfield, a Civil War veteran, operated a grocery store on the South side from the time he came until after the turn of the century. 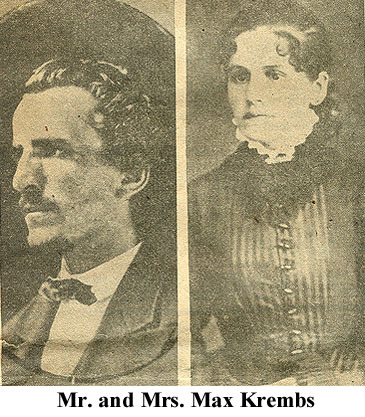 He married Phoebe Otis in 1855 in Stevens Point, They were the parents of seven children. A son, Alfred E. Redfield, who lived in Stevens Point all of his life, kept the family name here. He was a former postmaster here. He and his wife, the former Teresa Donermeyer, were the parents of seven sons. 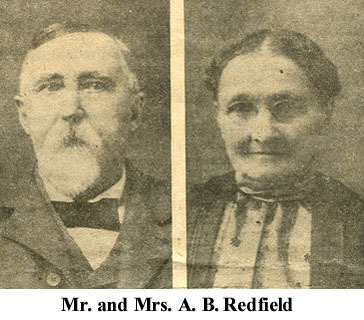 Of this family, two remained here, Ben A. Redfield, Stevens Point’s assistant postmaster, and Charles E. (Pete) Redfield. The others are John, San Francisco, Calif., Ray, San Diego, Calif., Robert, Oshkosh, and William, Michigan City, Ind. The Redfield home from 1860 to 1924 was at 916 S. Division St.
Frederick A. Bandow came to Stevens Point in 1850 and in 1857 he married Ernestine A. Radke at Watertown. Both were born in Prussia, he in October 1828, and she in April 1834. First he engaged in lumber and logging activities, running the Wisconsin River and working at various other occupations. He began the operation of the meat market in 1870 and closed it in 1879. He later re-opened the market and it was continued in operation by his family after his death. The Frederick Bandows were the parents of five children, Alexander W., Wilhelmina E., Louise C., Edith A., and Annette, all of who are not dead. Among the descendants are Harold Bandow, 806 Wisconsin St., Fred Bandow, Youngstown, Ohio, Mrs. Mabel Fisher, Porthill, Idaho, and Alex Bandow in Indiana, all the children of Alexander W.
The daughters, Wilhelmina and Louise, never married. Edith became the wife of Fred Pamperin, Green Bay, and Annette married Forest Grant, a brother of Admiral Albert Grant. The Forest Grants both taught in the local high school before going to New York City. The Frederick Bandow home was at 320 Water St., with the butcher shop adjacent on the south, the property continuing through to W. Ellis street to include the present site of the Weber Tackle Co. plant. In connection with the butcher shop there was a slaughter house and cattle barns. The first Finch to locate in Stevens Point was Benoni Finch, Milwaukee County’s first sheriff, who came here with his family in 1846. The elder Mr. Finch engaged in logging and running lumber on the Wisconsin River until his death in 1851 when his 17-year-old son, John, took over the operations. The latter, former undersheriff and sheriff of Portage County, married Miss Malinda Barrett. They were the parents of nine children, Mrs. E. R. (Frankie) Week, Mrs. August (Marion L.) Fulker, Mrs. Eugene (Lizzie A.) Martin, Mrs. Charles E. (Carrie E.) Smith, Henry J. Finch, Mrs. Frederick (Addie L.) Perkins, Robert B. Finch, Mrs. William (Merle E.) Fuller and John H. Finch, whose widow, the former Della Yorton, and their son, Robert, live at 438 Church St. The nine children of the senior John Finches have all died. 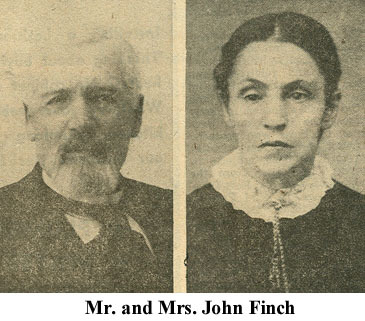 Mr. and Mrs. Week were the parents of three children, the Fulkers two, the Smiths one, the Perkinses two, the Henry Finches two, the Fullers four, and the John H. Finches six. The latter couple’s children, who spent most of their lives in Stevens Point, are Mrs. Richard (Marjorie) Abb, Neenah, Miss Ruth Finch, who teaches in Appleton, Mrs. Edward (Jane) Bamber, Pomona, Calif., and Mrs. Mavis (Mary) O’Bannon, Fort Meyers, Fla., besides Robert of Stevens Point. Another son, John Jr., died at the age of 12.